In an effort to ensure that Virginians are represented with integrity, Virginia gubernatorial candidate Terry McAuliffe is proposing the creation of an Independent Ethics Commission to oversee and enforce strong ethical standards on Virginia elected officials and their staff. 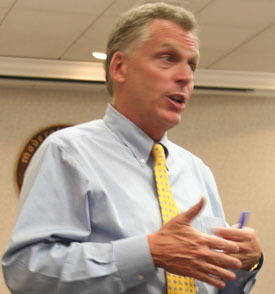 Last week, McAuliffe proposed a gift ban on elected officials that he would enforce on himself through an executive order even if the General Assembly doesn’t act. The Commission would have a small professional staff and would be empowered to investigate complaints or discrepancies in disclosure reports and refer violations of Virginia’s ethics laws and regulations to the relevant disciplinary body. They would ideally also assume some of the staff and duties currently held by the Secretary of the Commonwealth regarding lobbyist disclosures and activity. New expenses will be funded through lobbyist registration fees.